(Nanowerk News) Conventional biological wisdom holds that living cells interact with their environment through an elaborate network of chemical signals. As a result many therapies for the treatment of cancer and other diseases in which cell behavior goes awry focus on drugs that block or disrupt harmful chemical signals. Now, a new road for future therapies may have been opened with scientific evidence for a never seen before way in which cells can also sense and respond to physical forces. 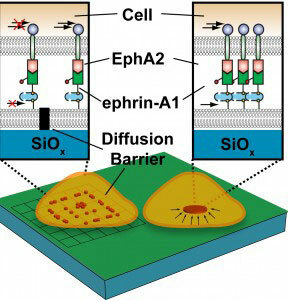 Metal lines embedded into a silica membrane beneath a cell act as a diffusion barrier, impeding the mobility of EphA2/ephrin-A1 signaling complexes so that they accumulate along the boundaries of the barrier. Without the barrier, the complexes are transported to a centralized location within the cell.